Re-painting parts of your vehicle is a common requirement after a collision. The struggle comes with matching the new paint to the old paint. If done incorrectly, your vehicle can look patchy and disjointed. Here at Freeway, we pride ourselves on offering natural and seamless paint matching thanks to our technician’s trained eyes and the Azko Nobel Mixit colour matching system. Read on to learn a bit more about how our computerized paint matching process works! We polish an area that is close to the area we will be refinishing. We do this to remove any contaminants and/or oxidation from the paint surface so we can get an accurate colour reading. We then bring out the colour camera. This is a special camera that helps us determine the true colour of your vehicle. The camera takes three different photographs, all at different angles. This will make sure your vehicle’s paint job looks natural anyway you look at it. The camera is then connected to the Mixit program on the computer. The colour from the pictures is uploaded into a database and is then compared to hundreds of thousands of colour variants. The program will give us the closest match and provide the formula for creating that colour to the nearest .1 of a gram. Just one drop of colour can make a huge difference, so this level of accuracy is extremely important to ensure a good match. Once we have the colour made, we paint a special 8” x 10” card and compare it against the vehicle in both natural and artificial sunlight to make sure we are happy with the match. Sometimes we get it right on the first try, and other times the colour will need to be adjusted slightly to get the perfect match. Once we are happy with the color, we apply it to the vehicle! Our comprehensive repair process will ensure that your vehicle is returned to you looking good as new. 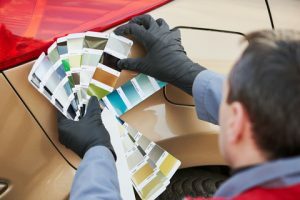 To learn more about our auto paint process, or any other auto body service, give us a call today!